“The new idea either finds a champion or dies” goes a saying. Well, let’s test it. Did Steve Jobs, the “God of marketing”, need a champion for his “Apple Computer” idea? He did! In fact, Mike Markkula, the person who first championed the idea, played a significant role as a mentor to Jobs in the initial years. “Mike really took me under his wing,” Jobs has mentioned in his biography. What exactly did Mike do? Let’s look at three things in this article. 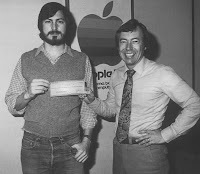 By the time Mike visited Steve Jobs and his partner Steve Wozniak in Jobs’ garage in the fall of 1976, the duo had already formed a partnership company named “Apple Computer”, had sold almost a hundred Apple I computers and made a profit and had designed a sleeker and improved version – Apple II. The problem was that Apple needed $200,000 to go into production. They had no credibility to raise the money. Their proposal had been turned down by Bushnell of Atari (Jobs’ ex-employer), Chuck Peddle of Commodore (potential competitor) and Don Valentine (founder of Sequoia Capital). “If you want me to finance you,” Valentine told Steve Jobs, “you need to have one person who understands marketing and distribution and can write a business plan.” Mike Markkula turned out to be that person. Isaacson, Walter, “Steve Jobs”, Little Brown, 2011, chapter 5 (Apple I) and chapter 6 (Apple II). Nice simple story that shows the importance of a champion. Even Steve Jobs needed one! !